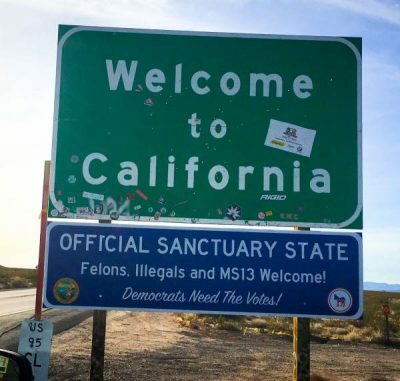 Welcome to California. Get your free Get out of Jail and Democrat Voter Registration Card. IHTM thanks whomever put this sign up. It has more truth in it than the entire state government has in their little fingers. I don’t know who did it, but I want to thank them and contribute to their cause!! When I first saw pics of this I thought it was Photo-shop but it’s fer real. Real accurate.